Imagine a set of tinted lenses that can help to manage dyslexia. Now imagine that a similar set of lenses can also correct for colour deficiency (commonly known as colour blindness). That is the promise of ChromaGen®, an exciting series of products that’s now available in Canada through Centennial Optical. ChromaGen is the brainchild of British optician and researcher David Harris, who began developing specially tinted lenses in the 1980s for people with colour blindness. In the course of his research, Harris discovered that by altering the wavelength of light that reaches the eye, the lenses also reduced visual distortions that make reading difficult for many people with dyslexia. ChromaGen, which has been available in the U.K.since 1997, was awarded ‘Millennium Product’ status for innovation and achievement by Britain’s Design Council in 1999. It has FDA clearance in the U.S., where it is sold by ChromaGen Vision, and was recently introduced into Canada through Centennial Optical, ChromaGen’s exclusive distributor in this country. The ChromaGen system consists of a series of lenses that incorporate combinations of 16 colour filters. Practitioners mix and match them to come up with the pair of lenses that works best for each client, says company President Ted Edwards. A different series of filtered tints works for each condition, he notes. 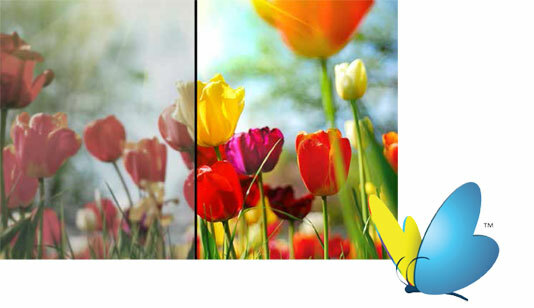 For colour deficiency, ChromaGen lenses alter the light wave as it passes into each eye, which dynamically balances the speed of information travelling along the optic nerve to the patient’s brain. This enhances colour perception and discrimination, enabling the user to distinguish colour and experience the full colour spectrum. For those with dyslexia, the use of different ChromaGen filters effectively changes the speed of the information in the brain’s neurological pathways, allowing the eyes to synchronize, Edwards explains. ChromaGen lenses, which look neutral gray when viewed on someone’s face, are available in Trivex and CR39 for bifocals and progressives, as well as single vision and plano lenses. They are fitted in either contact lens or eyeglass form and are easily incorporated into any existing prescription and frame choice. The effects are instantaneous and there are no side effects, says Edwards. Rick Leroux is director of marketing and communications, lens division, with Centennial Optical. He calls the ChromaGen system a reading aid, rather than a cure for dyslexia. The condition affects about 23 per cent of the population, according to the Canadian Dyslexia Association. Ophthalmologists, optometrists and opticians all can perform the diagnostics associated with ChromaGen, provided they participate in a one-hour training session and purchase a diagnostic lens kit. To date, three Canadian practitioners – all of them in Ontario – are using the system. Leroux says the product is relatively expensive (it runs into the hundreds of dollars) but notes that patients complete a test that determines its efficacy before ordering the lenses. For further information, visit IReadBetterNow.com. This entry was posted in Special Feature by Envision Magazine. Bookmark the permalink.